At the core of a Caldwell University education is its liberal arts curriculum, designed to foster critical thinking, appreciation of cultural diversity, and moral and civic awareness. Caldwell, New Jersey, has consistently been listed by NewJersey Monthly magazine as oneof the best places in New Jersey to live. Another advantage of our location is our proximity to New York City. Only 20 miles away, New York City acts as another classroom for our students, where they can engage in internship opportunities, experience cultural events, or just have fun! Colleges, Programs, and Degrees: Caldwell University offers 29 undergraduate programs as well as 30 graduate degree and certificate programs. Caldwell awards the following degrees: Bachelor of Arts, Bachelor of Fine Arts, Bachelor of Science, Bachelor of Science in Nursing, Master of Arts, PhD and EdD in Educational Leadership, and PhD in Applied Behavior Analysis. The University also maintains numerous affiliation programs in the health professions. Geographic Diversity: Students represent 23 states and 42 different countries. 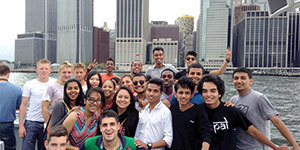 International Student Services: The Office of International Student Services advises international students on compliance with immigration laws and regulations, provides support to international students in cultural and social adjustment, and assists student, administrative, and academic groups in their initiatives to nurture and grow international programs. Financial Aid: At Caldwell, approximately 90% of our full-time undergraduate students receive some form of financial aid. International students are eligible for academic scholarships that range from $8,000 to full tuition as well as scholarships for students with a lot of community service and leadership that range from $1,000–$5,000. Talented students may also qualify for scholarships in art, music, and athletics. Caldwell University offers one of the lowest combined tuition, fees, room, and board of New Jersey’s private colleges and universities. Need-based financial aid is not available for international students. Test Score Requirements: Applicants must submit at least one of the following test scores: TOEFL, IELTS, SAT, ACT, or ELS Level 112 certificate of completion. However, in order to be considered for academic scholarships, applicants must submit either their SAT or ACT scores. At the core of a Caldwell University education is its liberal arts curriculum, designed to foster critical thinking, appreciation of cultural diversity, and moral and civic awareness. The knowledge, intellectual skills, sensitivities, and creativity you will acquire transcend any major of study and profession for a lifetime of growth. This is noted in a recent survey by the Association of American Colleges and Universities: 80% of employers agree that, regardless of major, every college student should acquire broad knowledge in the liberal arts and sciences. Caldwell’s most popular offerings include undergraduate degrees in Business, Computer Information Systems, Psychology, Nursing, and Education. Caldwell has 29 undergraduate degrees and 30 graduate programs, including the first doctoral program in New Jersey in Applied Behavior Analysis (ABA), one of the most effective treatments for autism spectrum disorder. Caldwell also has several affiliation programs with other colleges and universities in the health professions, including Medicine, Dentistry, Physical Therapy, Optometry, Occupational Therapy, Veterinary Medicine, and Athletic Training. Enrollment numbers prove that more students are learning about the value of a Caldwell University education. Nationally recognized as a “Top College for Liberal Arts” by Wintergreen Orchard House, a leading provider of data on colleges, Caldwell University instills intellectual skills, sensitivities, and habits of creativity each student will draw on for a lifetime. Caldwell University has also been named a “High Return on Investment” college and a “Catholic College with High Starting Salaries for Graduates” by Affordable Colleges Online. Both of these recognitions show the quality of a Caldwell education is valued in the workplace. Caldwell is also featured as a College of Distinction, which means Caldwell has been found to excel in four areas: student engagement, quality of teaching, vibrancy of the college community, and success of graduates. Offering a stunning campus setting, Caldwell University is only a short walk from town, where students find shops, coffeehouses, restaurants, a movie theater, and anything a student could want. Caldwell, New Jersey, has consistently been named one of the best towns in New Jersey to live in. Another advantage to Caldwell’s location is its proximity to New York City. Just 20 miles away, our students use New York City as another classroom, where they can engage in internships and job shadowing opportunities, experience cultural events, shop, or catch a game! Hopping on a bus takes you to lots of great sites in New Jersey too. A short ride offers a great selection, from the Meadowlands arena to the Prudential Center to, in just an hour, the Jersey Shore. Caldwell University enrolls over 2,200 full-time, part-time, and graduate students. Diversity is a key element of our campus community. With a student population representing 23 states and 42 countries, our campus is very diverse. Fully qualified faculty members, small class sizes, and a 12:1 student-faculty ratio provide close, personal attention that helps international students enjoy the best educational experience possible. Approximately half of our full-time students live on campus. Single, double, and a few quad rooms are available. A 200-bed apartment-style residence, Dominican Hall is state of the art, with modern suites, kitchens, and wireless internet capability. The food service features extended hours and an expanded menu, with both American and international food selections. Caldwell University has over 30 clubs and organizations in which our international and domestic students participate actively and enhance their leadership qualities. Our institution believes in serving others, and many of our students volunteer in various community-oriented activities. 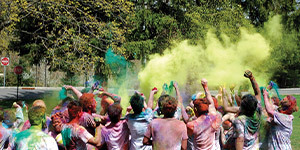 These clubs and organizations further enrich the experience of our students and enable them to have a fun time on campus. We also offer Greek life; our students are members of two sororities and one fraternity. At Caldwell University, developing the whole person is highly valued and a part of the culture of the campus. Students learn many life lessons from real-life experiences that help build a foundation of values, citizenship, and character. Caldwell students make a difference as they become involved in community service and campus ministry. Through clubs and organizations, students participate in leadership initiatives, gain friendships, and continue in the Dominican tradition of helping the needy. Caldwell Campus Ministry ambassadors volunteered with Jersey Cares to help rebuild homes devastated by Superstorm Sandy along the Jersey Shore. Graduate students studying Art Therapy also had the opportunity to work with families affected by Superstorm Sandy while working with Jersey Coast Creates, conducting art therapy activities at a series of healing arts workshops. Caldwell students have participated in building churches in Belize and have also traveled to Appalachia to repair and build homes for the needy. During our annual Service Day, classes are canceled as students, faculty, and staff provide assistance at various locations in New Jersey. From helping local food banks to painting classrooms in a local Catholic school to providing companionship to the elderly, the spirit of Caldwell University is spread far and wide on Service Day. Through these inspiring experiences, Caldwell University students gain life-altering experiences and lessons of gratitude while kindling friendships as this small campus takes big steps to change the world around them. Caldwell University fields NCAA Division II teams in men’s baseball, basketball, cross-country, soccer, sprint football, and track & field and in women’s basketball, bowling, cross-country, lacrosse, soccer, softball, tennis, track & field, and volleyball. There is a variety of recreational sports as well. At Caldwell, approximately 90% of full-time undergraduate students receive some form of financial aid. Caldwell offers academic scholarships that range from $8,000 to full tuition as well as scholarships for students with a lot of community service and leadership that range from $1,000–$5,000. Talented students may also qualify for scholarships in art, music, and athletics. Caldwell University offers one of the lowest combined tuition, fees, room, and board of New Jersey’s private colleges and universities. 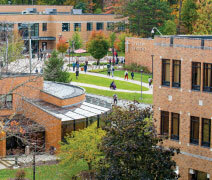 Plus, combined with our financial aid offerings, Caldwell often has a lower price than many public institutions. Need-based financial aid is not available for international students.